Welcome to visit http://www.topearl.com/evil-jewelry-c-110_225.html for evil eye bracelets, evil eye necklaces jewelry. Simple, elegant and unfading. This is the pearl. With a beauty so unique that can span from one generation to the next, a pearl is indeed a worthy investment. Pearls now come in a variety of shapes, sizes and colors never imagined before. No longer is the pearl limited to just the round and white. Irregularly shaped pearls are now popular as well and that includes the mabe variety. They maybe unheard of but yes, thereâ€™s a pearl variety called mabe that possesses a very unique shape. This type is a large, half-spherical cultured pearl with a flat back that grows on the interior shell of a mollusk and not on its body. Also known as the blister pearl while still inside the oyster (Pteria penguin), mabe pearls are intentionally grown ideally in tropical and subtropical waters. 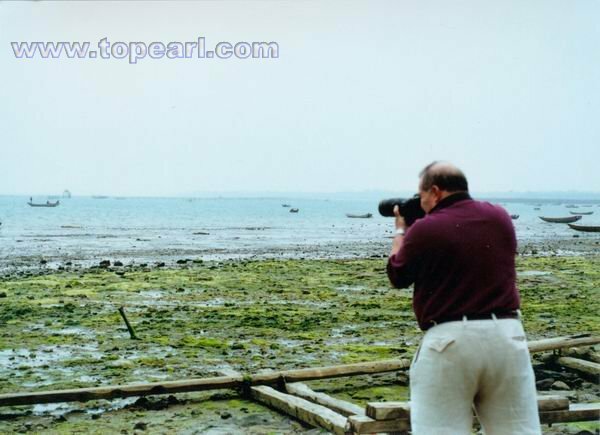 Topearl.com had printed jewelry catalogs including more than 200 jewelry items. You can post your jewelry ads freely in the platform. Vickie like to take photos; he use up his all films. 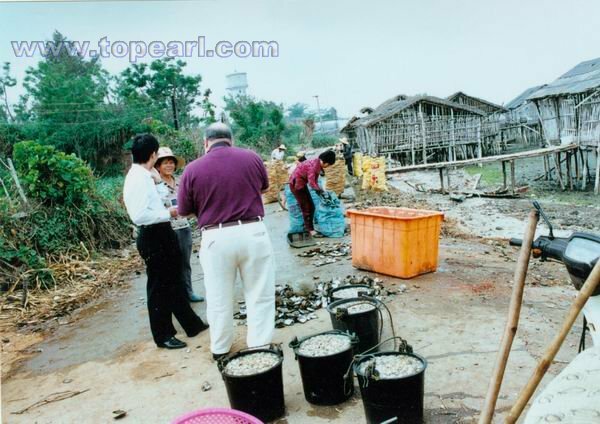 When picking up pearl inside, the oyster shells can be used to make shell jewelry,shell buttons and oyster meats can be eaten that is delicious. Cickie never see these goods; he also was interested with them, not only pearls and pearl farms. The white shirt in the middle is me, Mark Wu. Vickie chated with the woman farmer; I have to become translator. In my home town, many people can not speank Mandarin or Cantonese; they only speak my dialect. So even if you can speak Mandarin, you can not communicate with them. We only choose baroque akoya pearls with little tails in holes; these akoya pearls are baroque shape, very high luster, light blemishes. Baroque akoya pearls are unique in their appearance. In addition, unlike freshwater baroque pearls, our baroque akoya pearls have high lusters. Baroque pearls are popular form someone because they think this type pearls look more natural and they think the imperfections only can add to the beauty. The colors of akoya baroque pearls include white,black,light yellow. Akoya baroque pearls will be made to akoya pearl necklace jewelry,bracelets,pendants, and earrings. If you are looking for natural,unique jewelry with very reasonable price, yet still beautiful, our akoya baroque pearl jewelry is the best choice. 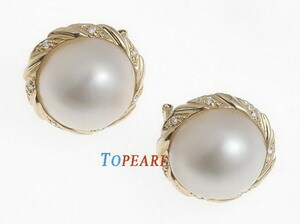 Comparing to roung akoya pearl jewelry with the same luster, the price is very very cheap! Welcome to wholesale them from us! Hong Kong Internatioal Jewelry Show held on 6-10 March 2007. 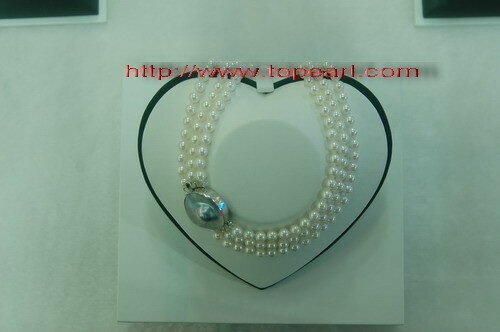 Totally the prices of akoya seawater pearls,Tahitian black pearls and South sea pearls sharply rise about 20 ~ 35%. Because the output of Chinese akoya pearls decrease this year, the cost of akoya pearls' materials rise. 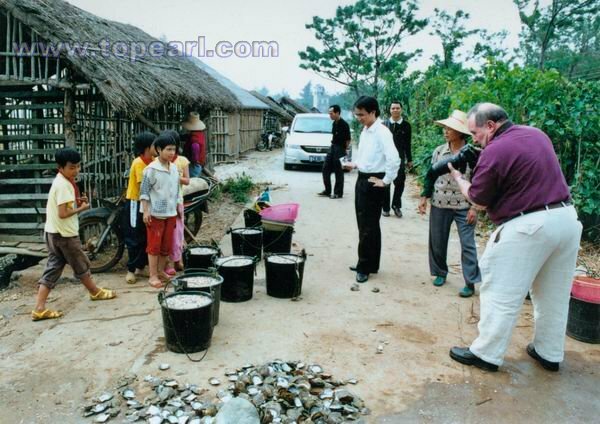 At the end of 2006 year akoya pearl manufacturers had ordered the akoya pearl oysters with pearls from the pearl farmers in advance, the prices are more higher 20~30% than the prices of 2006 year. In HK jewelry show, the Chinese akoya pearls don't sell very well because the high price. Most of customers think the prices is too high comparing to last year, they don't know the cost of akoya pearls rise. My friends, many pearl manufacturers also complained that the customers didn't learn the condition of Chinese akoya pearls. If they sold these prices at the prices of 2006, they lost money of course. 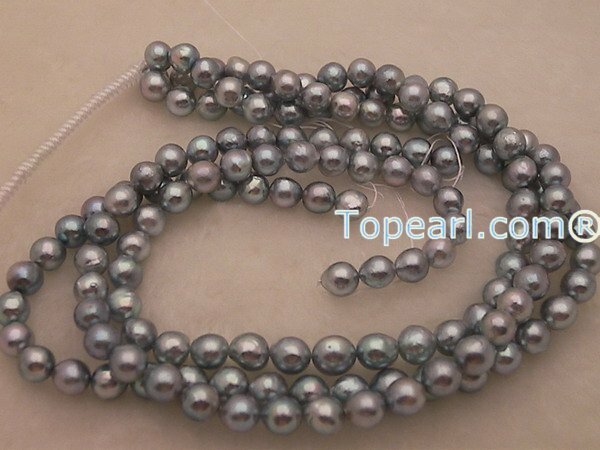 For example, for the ordinary quality 7-7.5mm akoya pearl strands, the original unit price is about RMB650.00 per 16" strand in 2006, but now the wholesale price have to rise to RMB800.00 per strand. The prices of our akoya pearls are still the prices of 2006. 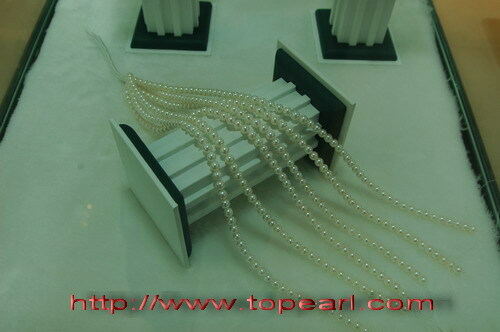 Frankly, because akoya pearls are not our main online business, the prices are very low. Welcome to order our akoya pearls - akoya pearl necklaces,bracelets or pendants. Maybe after several month, we have to rise our online prices a little. Happy the Chinese Spring Festival for everyone! Good business for everyone in the year of 2007! In our showroom of Liwan Plaza, Chinese akoya pearl jewelry is displayed here. Our new showroom was just opened in 2006/10/15. 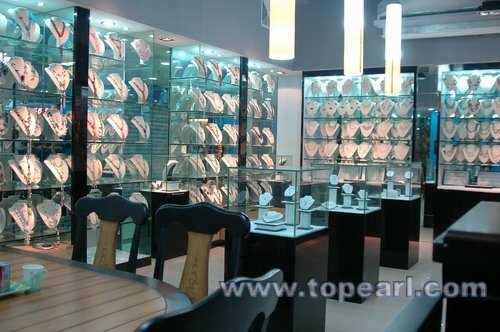 The showroom focus on designing all kinds of finished jewelry products. Welcome to visit our showroom anytime when you get to Guangzhou China. The address is North Tower Liwan Plaza,Kangwang South Road, Guangzhou 510140,China. From the photo, you can see beautiful Accent Furniture in our showroom. Two Jewelry Armoires in our showroom. In order to satisfy our customer request, topearl.com bigin to sell electric pearl or gemstone drill machine. The pearl drill is perfect for Akoya pearls, Freshwater pearls, South sea & Tahitian pearls, coin pearls, stick pearls. It doesn't limit the drill to pearls only though! It smoothly drills Amber, Copper, silver, gold, coral, and many other soft gemstones. Only USD310.00 each, Retail price is at least USD900.00 each. 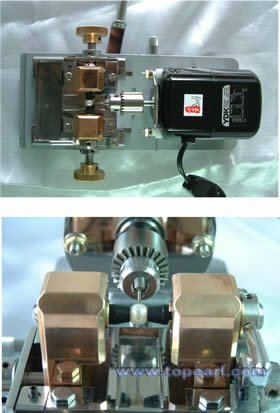 Please go to pearl drill machine to order it. I built a new Reciprocal Link Directory this month - http://www.topearl.com/dir/directory/ . Welcome to exchange your webiste URL with my website if your websites have similar themes to Pearls,Other jewelry,Crafts and Gifts related. Our company have decide to build a big showroom in Liwan Plaza,Guangzhou City. Welcome to visit on Sept.